Q5® High-Fidelity DNA Polymerase sets a new standard for both fidelity and robust performance. With the highest fidelity amplification available (~280 times higher than Taq), Q5 DNA Polymerase results in ultra-low error rates. Q5 DNA Polymerase is composed of a novel polymerase that is fused to the processivity-enhancing Sso7d DNA binding domain, improving speed, fidelity and reliability of performance. Q5® High-Fidelity DNA Polymerase is a high-fidelity, thermostable DNA polymerase with 3´→ 5´ exonuclease activity, fused to a processivity-enhancing Sso7d domain to support robust DNA amplification. With an error rate ~280-fold lower than that of Taq DNA Polymerase, Q5 High-Fidelity DNA Polymerase is ideal for cloning and can be used for long or difficult amplicons. Q5 High-Fidelity DNA Polymerase is supplied with an optimized buffer system that allows robust amplification regardless of GC content. The 5X Q5 Reaction Buffer contains 2 mM Mg++ at final (1X) reaction concentrations and is recommended for most routine applications. 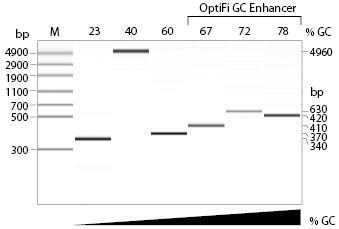 For GC-rich targets (≥ 65% GC), amplification can be improved by the addition of the 5X Q5 High GC Enhancer. Q5 High-Fidelity DNA Polymerase is unlike typical, lower fidelity PCR enzymes. To determine the optimal annealing temperatures for a given set of primers, use of the NEB Tm Calculator is highly recommended. Amplification of a variety of human genomic amplicons from low to high GC content using Q5 High-Fidelity DNA Polymerase. All reactions were conducted using 30 cycles of amplification and visualized by microfluidic LabChip® analysis. What are the advantages to using Q5® High-Fidelity DNA Polymerase? What is the fidelity of Q5® High-Fidelity DNA Polymerase? What should my primer concentration be when using Q5® High-Fidelity DNA Polymerase products? How should I set up a PCR experiment using Q5® High-Fidelity DNA Polymerase? My template is GC rich or supercoiled. How can I optimize my product yield using Q5® High-Fidelity DNA Polymerase? Do I need to modify my annealing temperature when using the Q5® High GC Enhancer? When should I add the High GC Enhancer? Are the DNA fragments produced by Q5® High-Fidelity DNA Polymerase blunt-ended or do they have the single-base 3´ overhang that Taq DNA Polymerase yields? There is a precipitate in the bottom of the buffer tube. Is this normal? What length of product can be made by Q5® High-Fidelity DNA Polymerase? I am having trouble amplifying a template that is longer than 5kb. How can I optimize my product yield using Q5® High-Fidelity DNA Polymerase? Does Q5® High-Fidelity DNA Polymerase exhibit a strand displacement activity? Will Q5® High-Fidelity DNA Polymerase incorporate dUTPs? I'd like to clone a fragment amplified with Q5® High-Fidelity DNA Polymerase. Do I have to blunt-end clone? Do other polymerases work in Q5® Reaction Buffer? I am competing in the iGEM competition. Do you have any products that I should consider from NEB? Q5® is a registered trademark of New England Biolabs, Inc.